With nearly 35 years of practicing Feng Shui in her life and businesses, Sally wrote this Amazon “Best Seller” 18 years ago and it remained on the this list for over 3 years. Nothing has changed but the values of this ancient philosophy have been “watered down” and horribly misinterpreted by many who profess to use the terms. 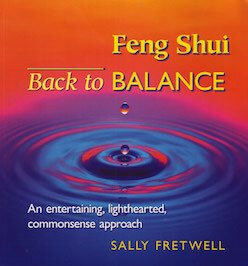 Enjoy the essence of Sally’s practice through her books. “Feng Shui” became a buzzword in the mid eighties. It became a fad that was supposed to be an enlightened approach to being one with our living environment. I wrote this book about Feng Shui because in essence, Feng Shui is not the superstitious rules, rules, and more rules philosophy that many people think it is. Feng Shui is common sense. The ancient philosophers used it to site their castles so that they were protected from their enemies and so they could have clear vision and be in command of the land. So when used practically in our culture, it is using nature’s gifts such as sunlight to support our over all well-being. My book is filled with stories of how the philosophy is beneficial in our world and it debunks the craziness of some interpretations that are out there in print. It is purely seeing and taking advantage of good flow and how you site, build, use color, install driveways, lighting, where you put a pool or design a home or commercial space. Example: If you design a home that has a kitchen in the East, you will have early morning sun in a room that is beneficial to energizing a space where you start your day. Being aware of “Energetics” and what supports you allows you to take advantage of “Feng Shui”.